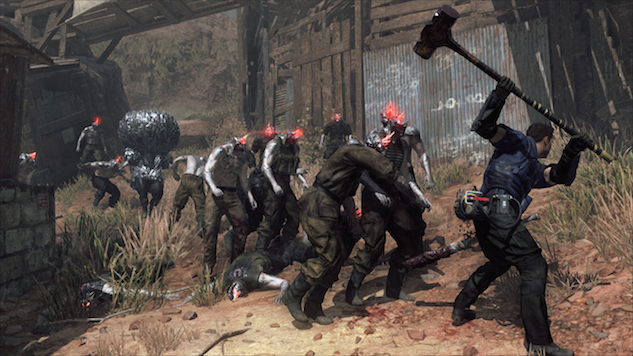 The Hideo Kojima-less Metal Gear spin-off will shamble on, as Konami announced that the once-delayed zombie survival game plainly titled Metal Gear Survive will release in February. Taking place after Metal Gear Solid V: Ground Zeroes, Survive puts players in the role of soldiers who were sucked in by a mysterious wormhole, placing them in a dangerous environment filled with terrifying and bloodthirsty creatures. The game requires players to scavenge the area for resources, as well as to build and develop bases and advanced weaponry. The game will continue the series’ tradition of stealth and action gameplay, with players being able to experience the game solo or in a four-player co-op mode, in which players can collect loot—sounds like a modern-day videogame to us. Speaking of which, expect some preorder bonuses, as well. Konami hasn’t totally phased out videogames for pachinko machines just yet, so be sure to enjoy (or not, if you’re a Kojima loyalist) Metal Gear Survive when it releases for Playstation 4, Xbox One and Steam on Feb. 20.